I don't like the rear; it reminds me of Hyundai Sonata. Overall, I think it looks much cheaper than the other flagship sedan. Compared with the S-class it has no presence and not elegant at all. I don't think the S-Class is some amazing design exterior wise. Its safe and predictable. Without the sport package it really lacks to my eyes. With the E and C class looking identical, that doesn't help. In regards to proportions, my goodness they did nail it there. No confusing this is a big time luxury car. No SWB here helps. The S/7/A8 are handsome but predictable. The Quatrroporte just missed the mark. The Panamera is really sporty and a hatchback. I think there is significant opportunity for the LS if its a design knock-out. Carmaker1 and meth.ix like this. For me the XJ looks really incredible from some angles and really standard from others. It's handsome overall, and I really like the headlights, but it's not the kind of knockout Jag used to be known for. Joaquin Ruhi, Carmaker1, Gecko and 1 other person like this. 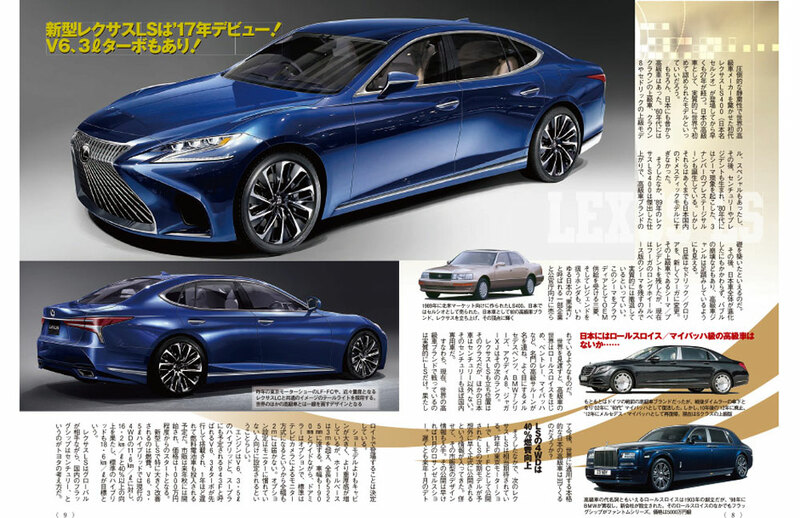 The article refers to Rolls Royce and Maybach as "super luxury" and says that although the debut of 5LS will a new chapter for Japanese luxury car, Japanese car manufacturers will still be unable to enter into "super luxury" segment. This is amazing, thank you so much for the translation! Joaquin Ruhi and meth.ix like this. Joaquin Ruhi, oem_is300, Den and 4 others like this. This is my favorite render! The only thing is the headlights; Lexus cannot use the GS offset DRL again - horrible. Everything else is spot on! I cannot wait to see what the actual LS will look like, but if it is anything close to this, I'll be happy. I have to admit, this is my favourite rumor so far. The design looks really nice. Regarding the engines, I was expecting the LC engines move to LS; the new hybrid system with such MPG numbers looks really good too. Excited about the new engines, but more so the likely design of the production vehicle. If I have one nitpick it's the rear section for which a combination of Camry, ES, and Azera pop in my mind. Agree with everything but the LS F, The F Brand is a brand new company and it's no surprise that their vehicles don't perform as well as it's competition, even though it does in some cases. An LS F would be absurd, and that's why it should be made. That is very much besides the point, as then what was the point of testing the LC500 and many other Lexus models there then? Even the LS 460 was tested there in 2005, it was deliberately being hidden. Anyway, any LS discussion from me has ended for now. Not in the position to discuss this car publicly anymore (cannot wait!). Thanks everyone, bowing out from this thread for now (in the meantime). will really Lexus unveil the LS in next NAIAS??? we are around 3 months away and nothing appear from them until now !!!!!! Thank you both, appreciate that a lot as many have reservations for the X351 design. Problem is the replacement is very much in limbo due to infighting and inability to commit to decisions, so IDK. Joaquin Ruhi, CIF, meth.ix and 1 other person like this. Excellent points Carmaker1 in your various replies. I sadly just don't have the time to fully reply to all your points. Besides we have discussed the 5LS here quite in depth. I will quickly mention, your comments about the S Class being seen at Toyota facilities a couple of years ago, combined with the lack of S Classes with public 5LS testing makes sense now. I think you're totally correct that Toyota did most of its S Class testing and comparisons in secret, and now with public 5LS testing underway, it seems they've carefully only shown the sportier competitors being benchmarked (in public). The S Class is the king of this segment, so it would make absolutely zero sense for Toyota to ignore that model. I knew there was a logical explanation for lack of S Classes seen as competitor benchmarks in the 5LS public test shots. Also now obvious, but yes given that the 5LS has already been seen publicly testing in Colorado as well as Death Valley, this simply indicates that the production debut is coming soon. The general pattern for Toyota is that when future models are spied publicly testing on US roads, that indicates a coming production debut in the near future. Also many thanks White Beach for the invaluable Japanese translation of the Best Car article! meth.ix and Trexus like this. Next gen LS spotted again! Japanese scoop website Spyder7 has some new spy shots of 5LS. Spyder7 reports that it got a photo of (a part of) the sedan's dashboard for the first time. -Spyder7 caught the interior of 5LS for the first time. The steering wheel and its switches can be seen. I personally think that side mirrors of the prototype seen in the spy photo can hardly be dummies. They are beautifully designed and far better than that of existing Lexus sedans. Besides this article, there are actually a lot of media outlets these days which claim that 5LS will be mirrorless. Is it possible next year??? And the steering wheel seen on the spy photo is the same as the one in LC? If so, it's quite disappointing for me. LC's steering wheel is too sporty for LS and more than that, it looks cheap, especially compared to that of S class or 7 series IMAO. Especially the S class' wheel is just superb: both its elegant design and material are amazing IMO. Den, Joaquin Ruhi, Lexus Cohen and 5 others like this. Lighter camouflage than ever! Long looog wait will soon be over! Den, CIF, krew and 2 others like this. I agree that the steering wheel looks quite disappointing compared to the competition with nice wood trim and brushed aluminum. The spy shots show a steering wheel that is too sporty for a full-size luxury saoloon. It would be okay for an F Sport model maybe, but if Lexus puts sportiness and sporty looks before luxury, that would be very disappointing for me. I also hope that the grille will not be mesh as stock. The mesh looks too sporty and it's only okay to be stock on a coupe like the LC. I also don't like the horizontal slats on the spindle grille either because they are way too thick and don't look luxurious at all (look at the new IS and GS). I think some vertical slats would look nice or if they are going to be horizontal, I think some thinner, chromier slats similar to the Nissan Cima or 3.0 IS would look the most grand. Those headlights look very handsome and shockingly similar to the renderings that @Carmaker1 showed us! The taillights look a little bit weird and remind me of the Tesla Model S, but that could just be the camouflage. The spyshots look much longer than the current LS so this could mean that this is the LWB model. 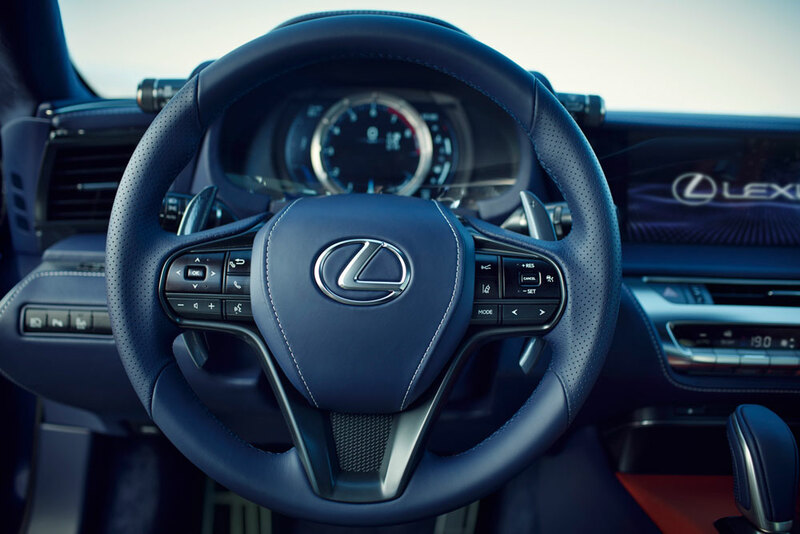 It wouldn't surprise me if Lexus was just using an LC steering wheel as a dummy for now. No doubt that the LS steering wheel is going to be wood and leather trimmed. Joaquin Ruhi, Ian Schmidt, White Beach and 1 other person like this. Look at those front fenders, the long hood, long wheelbase and sloped roofline. This car is going to be much more dramatic than any LS before. Joaquin Ruhi, Ian Schmidt, Lexus Cohen and 2 others like this. Considerably less camouflage and more detail revealed.